After spending the morning strawberry picking (photos to come later) we decided to head out to dinner. 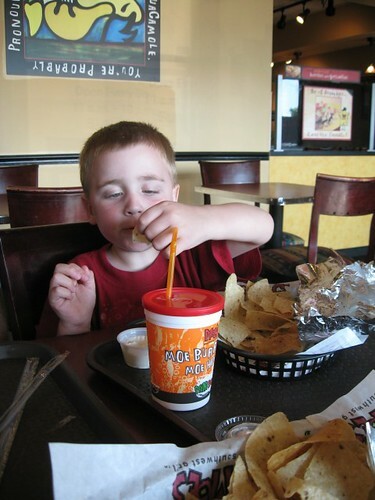 Kids eat free on Sunday at Moe’s so we went there for a quick meal before tub time. 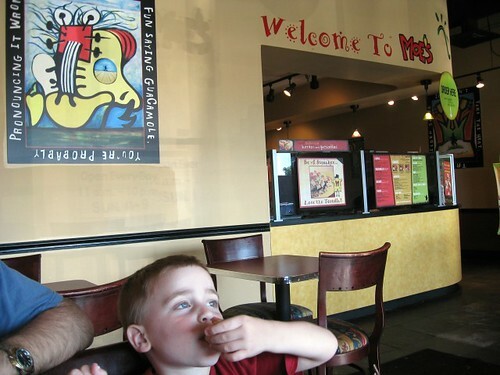 When you walk into a Moe’s they greet you with "Welcome to Moe’s" across the restaurant and then you get on line to order your food. Today we quickly noticed a paper posted at the counter. It certainly is a sign of the times given the constant food contamination problems plaguing us these days. As we all know the latest victim is the friendly tomato, a summer time favorite and especially important part of Mexican food. 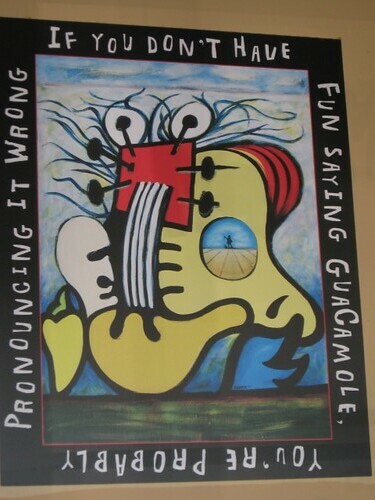 Moe’s decided to make customers laugh at the current situation with the following poster. We certainly missed the tomatoes in our food, but are happy not to have to worry about the consequences of eating them. The boys loved their food. 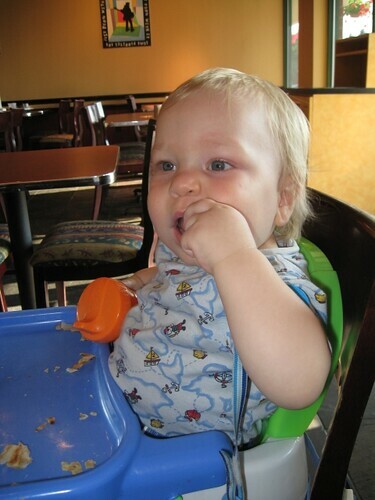 This is the first time JSL was awake for a visit to Moe’s and he loved his meal. As always JL and I were amused by the fun artwork at Moe’s. This is one of our favorites . . . be sure to read all the way around it. 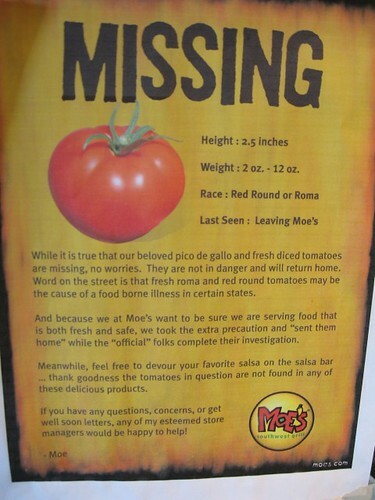 Hopefully next time when we head in and hear them say "Welcome to Moe’s" we will not be greeted with the tomato sign. Moe’s just is not the same without the tasty red summer goodness. After dinner we went to a local ice cream place for JL to have his free Father’s Day scoop. It was a fun day . . . now we just need to figure out what to do with six and a half pounds of strawberries! Welcome to MOES!! We love eating at Moe’s. Although, we haven’t been since all of the tomato chaos. I imagine it couldn’t be quite as good. I always get the Moo Moo Mr. Cow. It’s just the right size for me. And, before you read my latest post, I wanted to inform you that I consider you an honorary Southerner. There’s nothing Yankee about you, B! Moe’s looks like a fun place to eat! Love their sense of humor about the tomatoes! Looks like the boys enjoyed themselves, too.